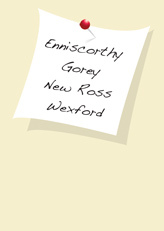 Wexford Farmers Market holds a market once each week in Wexford, New Ross, Gorey and Enniscorthy. Each market uses high quality producers to bring you the freshest food, which is superior in quality, taste and pleasure. Co. Wexford Organic Centre Established in 2002, the Organic Centre is conveniently located 6km outside New Ross on the N25 to Wexford. We grow a wide range of organic vegetables, salads, fruit and herbs which are sold here at the centre and through the four Co. Wexford Farmers Markets – Enniscorthy, Gorey, New Ross each Saturday 9 - 2pm and Wexford town Friday 9 - 2pm. We also operate a weekly box system, delivering delicious organic produce right to your door! To order, just fill in the form by clicking here and return it to the County Wexford Organic Centre. The Organic Centre is registered through the Organic Trust and is open to the public as a facility for certified training courses, workshops, demonstrations and community projects. We are also a demonstration farm, registered with the Dept. of Agriculture and Food. Anyone interested in converting to organic farming can seek advice at the centre – call Pat Roche (manager) for further details. Co. Wexford Organic Centre was set up by the Co. Wexford Partnership Co.
Jim Whelan’s beef stall is a mecca for meat lovers. You will find massive, well-aged, beautifully marbled rib roasts, succulent sirloin steaks and flavoursome shins as well as steak mince that will make the best burgers or bolognaise you’ve ever had. For insurance, ask Jim for a recipe, he’s always ready to oblige. Killowen Yoghurt is made by Nicholas and Judith Dunne at Green Valley Farms in Courtnacuddy, Enniscorthy, Co.Wexford. Killowen is a whole milk yogurt with a unique creamy taste which has been perfected over the last 25 years. Milk is sourced from the farms own dairy herd. Killowen yogurt contains no artificial colourings, flavourings, additives or preservatives. Killowen Bio-Live Yogurt sizes vary from 125g, 450g and 1litre.Varieties include Natural, Strawberry, Raspberry, Forest Fruit, Hazelnut, Rhubarb, Cherry and Vanilla. We also sell Cream Cheese, Yogurt Desserts and Smoothies. 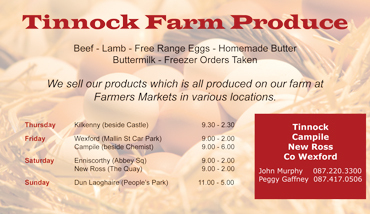 Visit our stall at the Enniscorthy Farmers Market, where you will find the finest potatoes, onions, carrots and cabbage. Bernadette O'Brien, "The Lavender Lady"
Come to my stall at the Enniscorthy Farmers Market and Local Agricultural Shows for lavender bags and sachets made from lavender grown in Boolavogue, Co. Wexford or Goats Milk Soap, by Roseacre Soaps. The Goats Milk Soap is made using goats from their own herd and ideal for suffers of Eczema or Psoriasis. In season, I also sell fresh lavender.